Part of the What Can We Do About Pollution? 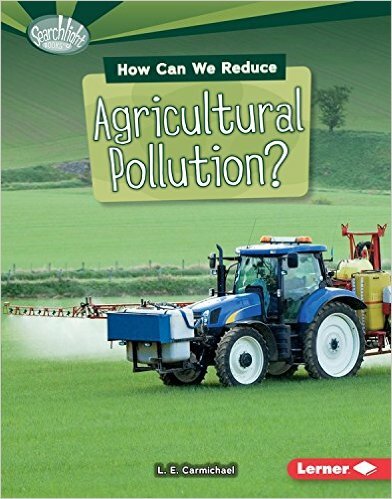 series from Lerner’s Searchlight imprint, the book covers three major types of pollution produced by agriculture – air, water, and biological. It also talks about some of the strategies farmers use to reduce pollution associated with food production. For grades 3-5. I grew up in Alberta, which is famous for both wheat and beef. It was interesting (and a bit scary) learning the science behind the smell of feedlots. For seven years, I lived in Nova Scotia, where aquaculture is used to raise fish and shellfish. Biological pollution – the spread of farmed animals into the wild – is a major concern with aquaculture. While researching this book, I learned new ways to reduce pollution on the foods I eat every day – I hope you will, too! "...present[s] environmental issues from a local and global perspective, framing the discussion around kids’ everyday lives... While the information is at times dire, it is fact-based, not alarmist. “How You Can Help” sections make a connection between personal activities and global effects, motivating kids to get involved with community cleanup and to write to encourage politicians to pass laws to improve the environment... will inspire young readers to join the cause for climate change."